"From what witnesses have said, it seems that some fans were jumping and dancing on the stairs," said Rome Mayor Virginia Raggi. An accident at an escalator in Rome that was caught on video Tuesday sent passengers speeding downwards and reportedly injured some 20 people, most of whom were soccer fans. Seven people were reported to have been seriously injured, according to the Associated Press, citing firefighters. None of the injuries were reported to be life-threatening. Officials said the injured were mostly Russians in town for a Champion's League soccer game between CSKA Moscow and AS Roma. 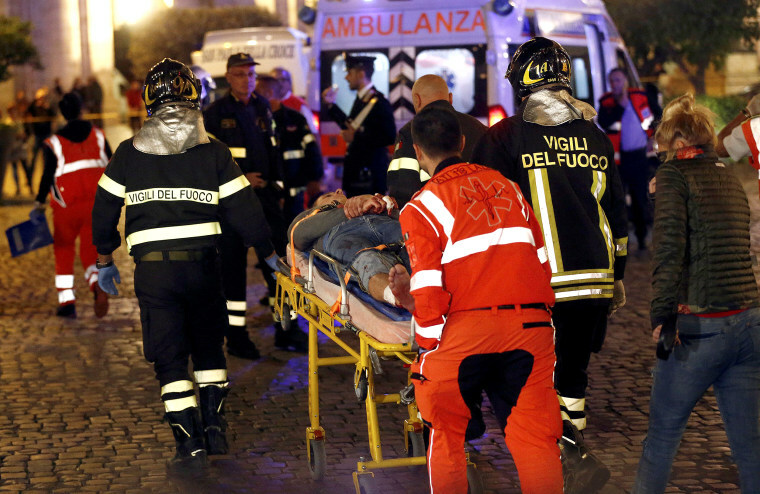 Italian state police tweeted that the metro station was closed after the incident. Video posted online shows people packed on the escalator heading down at a metro station when suddenly it speeds up, sending people trapped on the stairs tumbling at the bottom. One man heading down on a parallel escalator is seen helping another on the out-of-control escalator escape to the middle divider. The video was also posted on Italian state television RAI. The television channel broadcast images of fire officials responding to the scene. The game between the two teams was played at Rome's Olympic Stadium. Roma won 3-0. Rome Mayor Virginia Raggi visited the metro station and told reporters that "from what witnesses have said, it seems that some fans were jumping and dancing on the stairs." Rome provincial fire chief Giampietro Boscaino said that people were piled on top of other people in the aftermath of the incident. "People one on the top of the other looking for help. They had various injuries caused by the escalator that was twisted, therefore serious injuries," Boscaino told the AP. Other images posted on social media appeared to show broken escalator steps at the bottom. Video posted by the fire department showed fire crews bringing people up the stairs to safety, and it said that all those injured were sent to hospitals. Italian news agency ANSA quoted city transport agency officials as saying maintenance is carried out on metro system escalators every month, according to the AP.